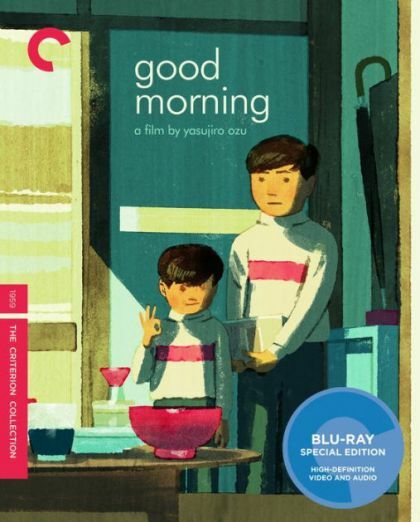 Plot A lighthearted take on director Yasujiro Ozuï¿½s perennial theme of the challenges of interï¿½generational relationships, Good Morning tells the story of two young boys who stop speaking in protest after their parents refuse to buy a television set. Ozu weaves a wealth of subtle gags through a family portrait as rich as those of his dramatic films, mocking the foibles of the adult world through the eyes of his child protagonists. Shot in stunning color and set in a suburb of Tokyo where housewives gossip about the neighborsï¿½ new washing machine and unemployed husbands look for work as door-to-door salesmen, this charming comedy refashions Ozuï¿½s own silent classic I Was Born, But . . . to gently satirize consumerism in postwar Japan.